BGL Basics: How Do I Add Items to the Map? To add items once you have created your map, click on the “Add Items to your Camp” button as seen below. 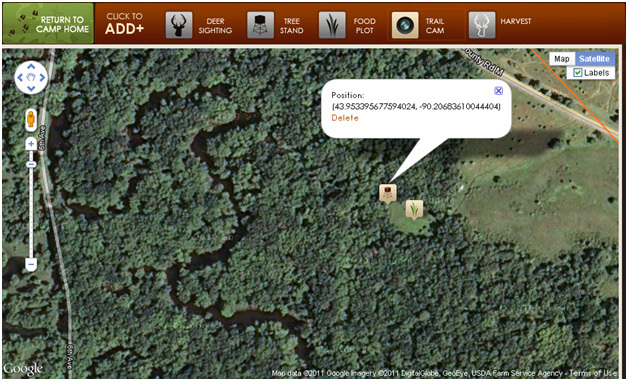 This will allow you to add stands, trail cams, food plots and deer sightings to your map. Clicking the Add Items button takes you back to your map. On the top border of your map you will see 5 Icons. To select an object you wish to add to your map you simply click on the icon and then click on the map you wish to place that object. You do not need to click and drag. Deer Sighting - Use this icon to pin point deer sightings on your land. A deer sighting is simple, it’s used anytime you had seen a deer or multiple deer whether it be from an actual hunt or just walking through the woods. 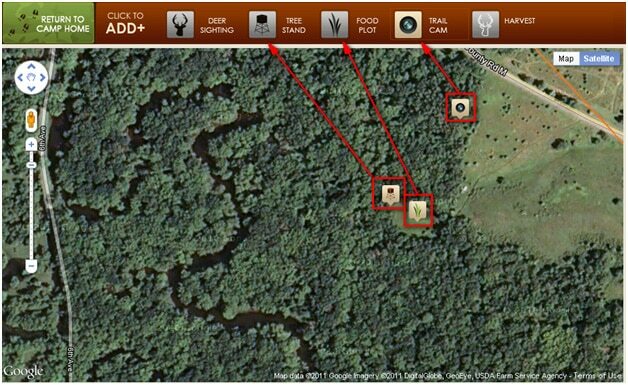 Tree Stand – Use this icon to store the locations of any hunting stands you have on your property. Food Plots – Use this icon to post any food plots that are in the area. The use of this will be enhance in future upgrades. Trail Cams – Place this icon in areas that you have trail cams on your property. Images can be uploaded right to this icon and tracked as a deer sighting. You will also be able to view any images you have stored to this location. Harvest – Place this icon in places you have harvested your game. You will be lead through a series of window to help you store data from that kill. This will be stored and located in your trophy room. All weather data from the hunt will be treated as a deer sighting. To place any of the tree icons on the map, click on the desired icon and locate the area you want to place the icon. HINT: To improve the accuracy of your placement, I recommend zooming in as far as you can on the map so you know you are in the right location. Once icon has been place, you can view the GPS coordinates to double check. Once you have found the location, click once with the mouse button and the icon will be dropped. You can place as many items on the map as you want. You can also view the GPS coordinates or delete the object from the Add Items map by clicking on the icon and viewing the popup window. Once you are done setting up your map you can save by Returning to your camp home. The button is on the top left corner.